I am a modest man. This is a fact, and furthermore it is true. However, I have unquestionable evidence to suggest I am the most intelligent man to ever grace, or have graced, this planet, and quite possibly the universe. I have made an observational observation, observing observationally how I am more a genius than Einstein. This is observant. Observe: Einstein is (or until this study was) regarded as the world’s most intelligent man. Yet I have discovered Pigeon Philosophy, and he never did. Indeed, Einstein never made any of the vastly important discoveries I did. Thus I must be vastly more intelligent than Einstein, and I am thus the most intelligent individual in the world. This observantly observant observation further proves this, because it is a vastly intellectual observation that nobody ever observed until myself. By the mathematical laws therefore, if I ever argue with someone I must be right because I am more intelligent. Thus, so long as someone disagrees with my studies, I am therefore always right. The laws of probability suggest there will always be some (unintelligent, foolish) individual that disagrees with what I say. Thus I am 100% right 100% of the time, 100% of the year with 100% of my statements, approximately speaking. If this reasoning is beyond you, it is simply down to my advanced intelligence over yourself, and you should take comfort in this intelligence because you can always trust what I say. Believe me (and of course you have no choice but to do so, due to your lacking intelligence) when I say this study came as much of a shock to me as anyone else. I first thought of the thought whilst thinking on the train, or so I think. 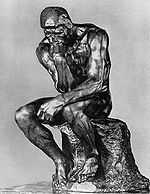 I initially thought about thinking of thinking about the thought, in a roundabout way, before dedicating myself to thinking about the thought thoughtfully and with particular thought. This made me thoughtful, and deep with thought. As I continued to think, my thoughts became less of thinking and more of certainty, as I thought of the overwhelming evidence supporting my theory. Hence, I was certainly certain at this certain point, and certainly forever after, certain in my certainty. I am as certain as I am intelligent. I am also as intelligent as I am certain, and almost as certain as I am thoughtful, which is very. I conclude with a conclusive conclusion: I am the most intelligent being on the planet, but I am nevertheless modest, and deeply humbled by my finding. This page was last edited on 21 October 2015, at 23:04.